Hey there! Thanks for dropping by waynecollierinspections! Take a look around and grab the RSS feed to stay updated. See you around! Electrical panels are boxes that house circuit breakers, which are are safety devices that stop the electrical current if it exceeds the safe level for some portion of the home electrical system. Many people, even experienced electricians, have been killed or seriously injured while opening electrical panels. In 1991, an Atlanta electrician was killed while attempting to inspect a panel that had a faulty spring-loaded bus-bar assembly. 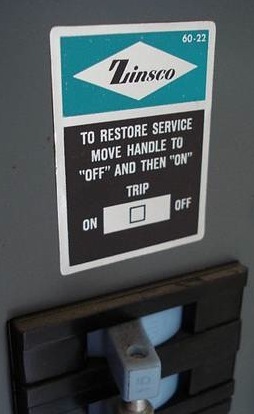 Apparently, the bus-bar was moved while the electrician was opening the panel, causing an arc and a lethal electrical explosion. Generally, two factors contribute to these situations: defective components and complacency. Do I have an escape path? Make sure that you know where you can safely turn or step if you must safely escape a dangerous surprise, such as bees or sparks. An unfortunately placed shovel or extension cord, for instance, can turn a quick jerk into a dangerous fall. Are the floors wet? Never touch any electrical equipment while standing on a wet surface! Does the panel appear to be wet? Check overhead for dripping water that has condensed on a cold water pipe. Moisture can arrive in more ways than you can imagine. Is the panel rusty? Rust is an indication of previous wet conditions that may still exist. As an optional safety measure, use a voltage ticker to make sure the box is safe to touch. If the alarm sounds on the device, have the box examined by a qualified electrician. Also, safety glasses and other personal protective equipment may be used to protect against burns and electric shock. Stand a little back while removing the cover, which makes it easier to remain in a blocking position. Stand so as to block your client from touching the panel and its components. inform the client that opening the panel is a dangerous step, and that if sparks fly, the client should not touch the inspector. insufficient clearance. According to the 2008 National Electrical Code, most residential electrical panels require at least a 3-foot clearance or working space in front, 30 inches of width, and a minimum headroom clearance of 6 feet, or the height of the equipment, whichever is greater. If obstacles would make it unsafe for you to inspect the service panel, you have the right to disclaim it. sharp-tipped panel box screws or wires damaged by these screws. Panel box cover screws must have blunt ends so they do not pierce the wires inside the box. Look for wires that pass too closely to the screw openings inside the electrical panel. circuit breakers that are not properly sized. oxidation or corrosion to any of the parts. Oxidized or corroded wires will increase the resistance of conductors and create the potential for arcing. damage caused by rodents. Rodents have been known to chew through wire insulation in electrical panels (and other areas), creating an unsafe condition. 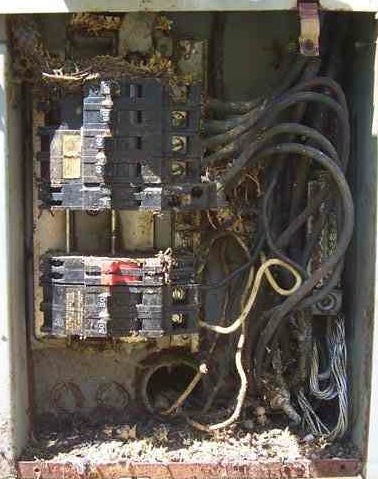 Rodents have been electrocuted this way, leaving an unsightly mess inside the panel. evidence of electrical failures, such as burned or overheated components. evidence of water entry inside the electrical panel. Moisture can corrode circuit breakers so that they won’t trip, make connections less reliable, and make the equipment unsafe to touch. evidence of missing or improper bonding. This may indicate improper wiring, damaged equipment or unsafe conditions. the physical contact points of the overcurrent protection device to the contact point of the buss are not making good contact. The sounds of arcing (a cracking or popping sound) may indicate this condition.